Have you ever wondered about the new Subaru BRZ's features, specs and more? Find out below! As the leading automotive writers performed countless hours of research on the BRZ to provide you with the most outstanding information possible. This Subaru review article contains everything you need to know about the BRZ and it's specifications, mpg and more. We wish you the best of luck in your search for the perfect Subaru! When comparing the 2013 Subaru BRZ side-by-side with the 2013 Mazda Miata, Ford Mustang and the Hyundai Genesis Coupe, and you'll catch that the BRZ wins over those autos in numerous aspects. Get a load of just a few of the reasons below. Get actual factory parts and amazing workmanship from Subaru technicians at a centralized site that's just a short spin from home. At our Subaru auto repair center in Kansas City, we offer this and a long-term warranty on all work! 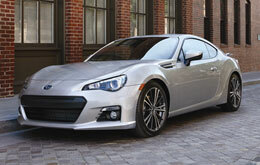 Keep your BRZ running without problems; have it serviced by Van Subaru's helpful car repair whizzes. For simple oil changes and other Subaru services like in-cabin air filter checkups and wiper blade replacement, come to us. We even take care of strenuous undertakings with finesse, including jobs like electronics repair. For quality Subaru repair in Kansas City, drive your BRZ to Van Subaru, where you can expect customized service. Get specials every day. You can look up discounts by clicking the next line of text.